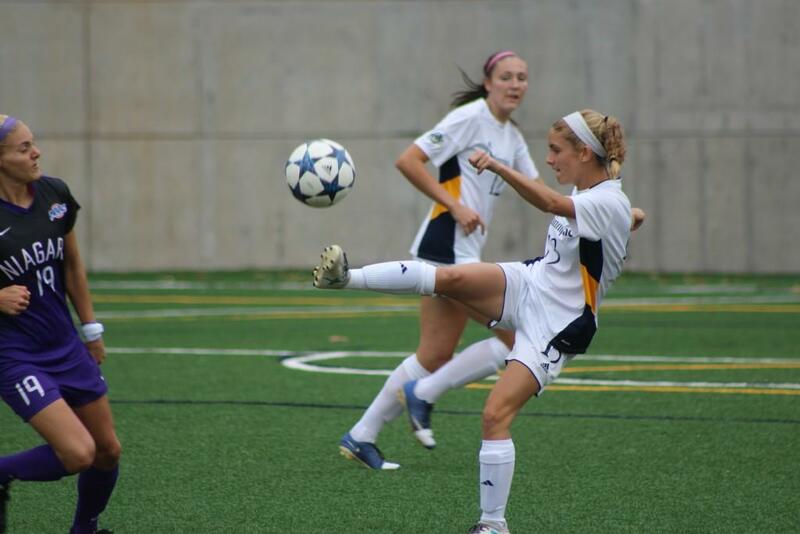 The Quinnipiac Bobcats women’s soccer team (6-6-2, 3-3-2 MAAC) came up even against the Canisius Griffins (4-6-4, 1-4-3 MAAC) on Saturday at home, as they tied, 1-1. The Bobcats entered the game on a two game skid and was looking to get back on track in MAAC play. Even though both teams tied in the end, the Bobcats dominated the Griffins in time of possession and shots, 28-4. However, when the Bobcats had a chance, rarely did they capitalize on the offensive side. The only time the Bobcats did score was when freshman midfielder Selena Salas tied the game at 1 off of a rebound around the net. It was Salas’s third goal of the season. However, the Bobcats were moving the ball quite effectively on the Griffins. When the Bobcats shot the ball, they had very good shots – just none found the back of the net. Many times, there were headers by senior midfielder Madison Boroweic. A very crucial header that could have tied the game earlier for the Bobcats was in the second half with eleven minutes off the clock, but it was called back for a close offside call. Quinnipiac had very fluent and crisp passing attack to set up a lot of the shots. However, goalkeeper Alana Rossi for Canisius was able to swat many of the shots away, as she had 10 saves on the day. The Bobcats started junior goalkeeper Charlotte Edmunds instead of junior Olivia Myszewski for the first half. Coaches thought it would play dividends, however Edmunds allowed the only goal for Canisius off the boot of Shauna Lee. Edmunds reached out for the ball in the sky, but Lee was able to bounce it off herself first with Edmunds out of the goal to make the score 1-0 in the first. However, after the first half Olivia Myszewski did come in for Edmunds. Olivia had the only recorded save for the Bobcats on the day, as she played the rest of the game. With the score 1-1 heading in overtime, the Bobcats remained aggressive in both periods. However, just like in the first and second half, they could just not get it behind Canisius’ goalkeeper for a goal. In overtime, the Bobcats had a few chances to score with a free kick in front of goal and a corner kick later both in the second overtime, but failed to convert. When Canisius had the ball, it felt more like a game of “keep away”. Canisius turned the ball over a lot and rarely got into the box to score. Quinnipiac’s defensive pressure made Canisius lose the ball very often and not allowing many chances, besides their lone goal. The Bobcats will play the Rider Broncs away on Wednesday, Oct. 17 at 7 p.m. Coach Clarke said that “Wednesday games are more the home games. I think when you travel it’s more the mental.” Rider will be going in after a 1-0 to Sienna on Saturday as well.